I love to laugh and enjoy good comedies, have a good laugh with friends, laugh at a good joke and like to make others laugh. Unfortunately I can never remember jokes, but hey there are enough reasons in life to laugh at and about. When you arrive at work in the mornings, have a laugh with your colleagues and the day will be enjoyable, bright and happy. I always find myself trying to find some type of opportunity to laugh. 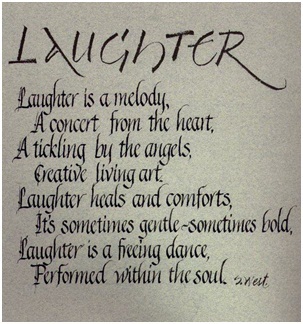 Try to incorporate laughter into your day. Go online and watch a video that makes you laugh. Call up a friend or family member that you find hilarious. Laughter is a part of human nature, and for something so truly unique to humans, it seems strange that so little is known about how and why we do it. 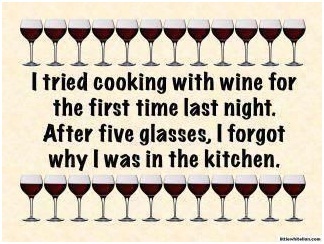 Laughter is largely a reflex to things we find humorous. Chemically it has to with releasing endorphins and the word dopamine comes to mind, but do we need to know this? Not really because laughing is great, we do not need a scientific reason to laugh, we just like to laugh. It makes us feel good and happy. Many people agree that laughter protects one’s sanity too, which is probably related to its ability to release stress and ease tension. We laugh at a joke or a funny expression or picture. We laugh when we are happy. We laugh when we get tickled. We laugh when others laugh and we join in. We laugh when we feel relieved. We can laugh when we feel embarrassed. Laughter is infectious. When laughter is shared, it binds people together and increases happiness and intimacy. Laughter also triggers healthy physical changes in the body. Humor and laughter strengthen your immune system, boost your energy, diminish pain, and protect you from the damaging effects of stress. Basically it makes you feel great. Have you ever laughed so much that that tears ran down your cheeks? And you feel you cannot stop? “Laughter is the best medicine.” There is strong evidence that laughter can actually improve health and help fight disease. Laughter gives you the courage and strength. Even in the most difficult of times, a laugh–or even simply a smile–can go a long way toward making you feel better. And laughter really is contagious—just hearing laughter primes your brain and readies you to smile and join in the fun. There is a special form of Yoga called Laughter Yoga, Yes you read it correctly a great stress relieve. The best place for it is with Yoga Nisha, a fantastic lady who can show you joyful living! Here is the link to her website, check it out. 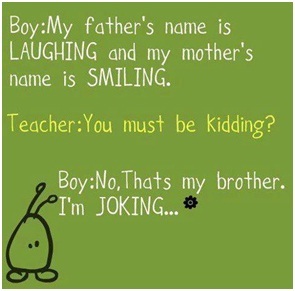 I love it :)” No that’s my brother, I’m joking” LOL . Keep laughing and enjoying life 😀 Bless you. Great you enjoyed a good laugh from this blog, the world looks so much better through laughing eyes! Laughter is the best medicine, my friend! Indeed, I so agree, thanks for reading such an “old ” post, which is though still very valid! Have a fun day with lots of laughter! Thank you for making my smile burst.